Squid are ubiquitous in every ocean. On the reef, they are seldom seen alone. Usually, divers and snorkelers will notice a line stretching down the reef — squid all arranged facing the same direction, moving easily along the contour of the bottom. Divers seeking to approach the squid quickly find themselves outmatched; the squid can easily stay out of reach and beyond effective photography range. 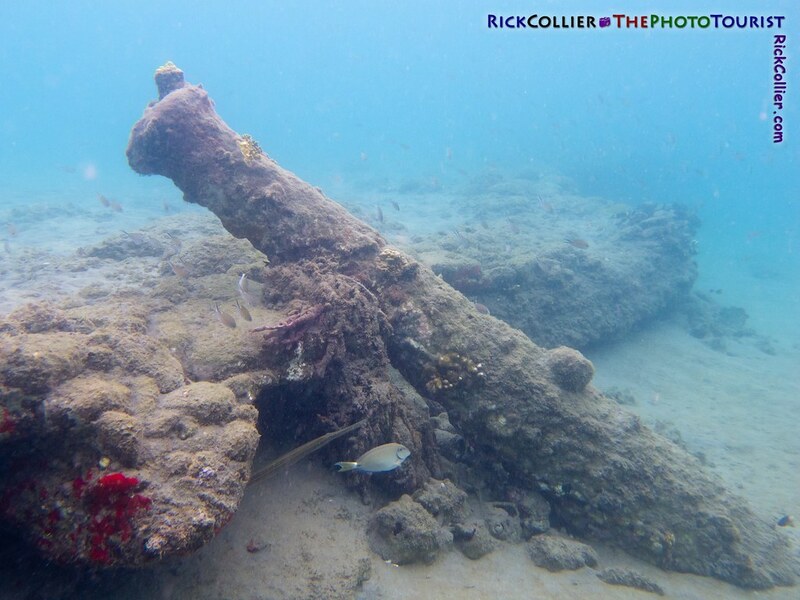 Probably the first sea life I saw on my first dive as a PADI divemaster candidate here at St. Elsewhere was just such a line of squid. As I dropped easily from the surface, the squid stretched below me in a line that extended to the limits of visibility in both directions. As my group reached their depth near the bottom, they easily accelerated and were gone. At night, the situation can be different. 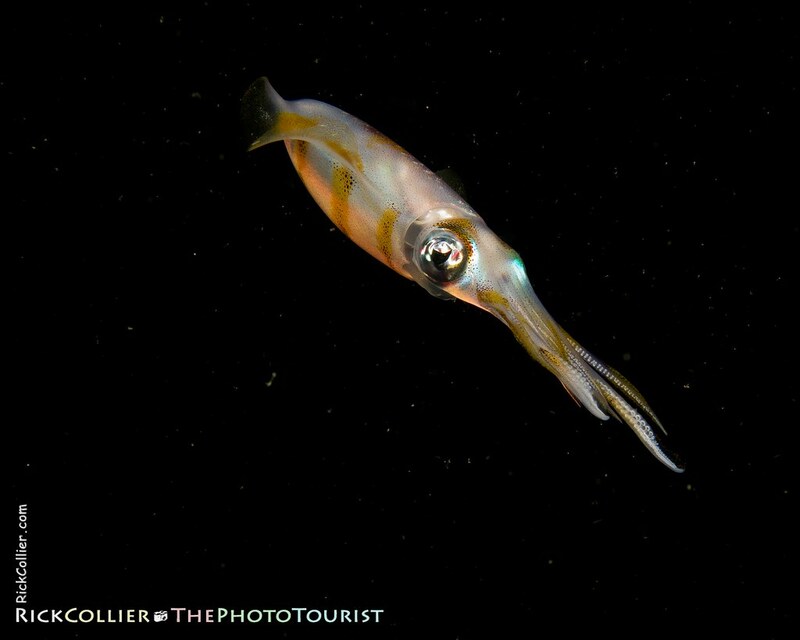 Reef squid are sometimes found alone (or perhaps, the diver does not notice the whole line as we might in daylight). Creatures including squid try to avoid too much movement in the dark and can become confused in a diver’s bright lights. Diving in the Lembeh Strait, I began using a Sola focus light from Light and Motion; on its red setting, the light seemed not to alarm the creatures too much. My strobes would temporarily illuminate them, then plunge the world into apparent darkness (where they would be safe). I could still see and focus using the Sola’s red focus light, but that light was much less intense and so less noticeable to my marine subjects. Using that light, the problem became one of adjusting strobes to minimize reflection from the inevitable small particles always suspended in seawater (called “backscatter”). This entry was posted on Tuesday, September 27th, 2011 at 16:06 pm. It is filed under thePhotoTourist and tagged with A Shore Dive Kinda Life, cannon, Canon, Caribbean, dark, divemaster, diving, Elsewhere, focus, focus light, Indonesia, jet, Lembeh, Lembeh Strait, light, Light & Motion, Light and Motion, line, night, night dive, North Sulawesi, PADI, photo, Photo Tourist, PhotoTourist, Saint, Sola, spotting, squid, St Elsewhere, strait, Sulawesi, swim, the Photo Tourist, thePhotoTourist, tourism, tourist, Underwater, wall. You can follow any responses to this entry through the RSS 2.0 feed.